K Falvey, Double R L (Mgr: Mrs R A Laing) & No Brainer (Mgr: A Pelikan), Mrs L McKenna, J Tingiri, G Hankinson, J Sutterby, G Sutterby, B Sutterby, S Scott, Mr M A Houlahan & Mrs J T Houlahan. SO YOU THINK (NZ) (Bay or Brown 2006-Stud Aust. 2012, Ire. 2013). 14 wins-1 at 2, MVRC WS Cox P., Gr.1-twice. Half-brother to SP Now You Know. 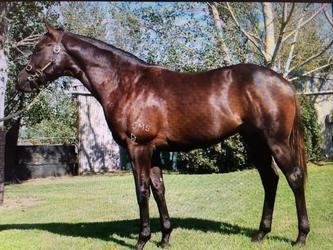 Sire of SW La Diosa (New Zealand One Thousand Guineas, Gr.1), Gold Rush, Northwest Passage, SP Inference, Kaching, So Si Bon, Smart as You Think, Conscious and of Neguev, Betcha Thinking, Rodin's Doll, So You Too, That Rings a Bell, The Pinnacle, Seracena, So Belle, Highleigh, Turbulent Air, etc. His oldest progeny are 3YOs. Liberty Rock (g. by Rock of Gibraltar). 4 wins-1 at 2-to 1400m, A$106,025, MRC Le Pine Funerals H., Sportingbet Best Tote H., 2d VRC Talindert S., L, 3d MRC Jimjoca H.
Shampers. Winner at 1000m in 2016-17, 2d MRC (Mornington) The Wow Signal at Swettenham 2YO H.
Altamira (f. by Lope de Vega). Placed in 2016-17 in Aust. Morerockthanready (g. by Rock of Gibraltar). Placed in Aust. STIRLING GROVE (Mossman). 7 wins-3 at 2-to 1400m, A$546,690, SAJC Sires' Produce S., Gr.3, VRC Schweppes Tonic P., My Room P., MRC Premier Signs P., SAJC Adelaide Casino Cup Day H., Schweppes Fulham Park 2YO P., Vodafone 2YO P., 2d SAJC Jansz S., Gr.3, MRC Doveton S., L, SAJC Manihi Classic, L, VRC Emirates Airlines H., SAJC Allan Scott Park Morphettville Flying H., 3d SAJC Goodwood H., Gr.1, MRC Schillaci S., Gr.2-twice, SAJC WH Wylie H., L, 4th SAJC DC McKay S., Gr.3. Vintage Grove. 2 wins at 1350m, 1500m in 2015-16, 2d SAJC Rewaaya P.
Approach Me. Winner at 1000m, MRC (Mornington) Land Engineering P.
Lord Sudurka. 3 wins to 1300m, MRC Nuffield H., 2d MVRC Omega Smeg H., 3d MRC Fairyhouse H., Le Pine Funeral Services H.
HUCKLEBUCK (Elvstroem). 8 wins from 1100m to 1600m, A$1,164,320, VRC Emirates S., Gr.1, Yellowglen S., Gr.3, CS Hayes S., Gr.3, MRC Gothic S., L, SAJC Durbridge S., L, Dominant H., Flight Centre H., 2d VRC Carbine Club S., Gr.3, 3d MRC CF Orr S., Gr.1, MVRC Mitchelton Wines P., 4th MVRC Australia S., Gr.2, BRC BTC Classic, Gr.3, MRC Testa Rossa S., L.
Courtza King. 2 wins at 1200m, 1400m, A$93,090, ATC Cellarbrations H., 2d ATC Tab.com.au P., BRC GA Season Pass H., 3d ATC All Too Hard at Vinery H., TAB Rewards H.-twice. Zaracha. Winner at 1300m, 2d Ipswich TC Jim McKenzie Memorial H.
Treasure Island. Winner at 1300m in 2016-17, 2d BRC Sky Thoroughbred Central H., 3d BRC Sky Thoroughbred Central P.
Irish Opera (Stravinsky). 10 wins at 1400m, 1600m, NZ$238,800, ARC Speight's H., Classic Hits H., Stella Artois H., Marton JC Waikato Stud H., ARC Auckland Co-Op Taxis H., Lindauer Brut Cuvee H., TJ McKee Trophy, Counties RC Mondiale Freight H., 2d ARC Easter H., Gr.1, Maurice Trapp Group H., Stella Artois H., Sun Microsystems H., Barfoot & Thompson H., Counties RC Avondale at Counties H., 3d BOP RC Japan-New Zealand International Trophy, Gr.2, Counties RC Peter & Joan Russell Memorial H.